Middle School Novel and Grammar Units also owns Creativity in the Classroom. Follow this link for more great products, including English and math products with more subjects being added soon. Our novel and grammar units are aligned to many of the Common Core Standards, including inference, main idea, elements of a story, and more! 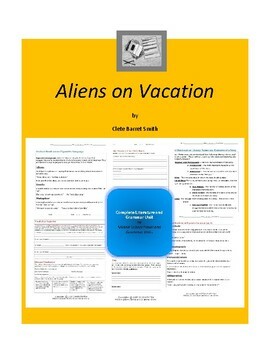 This is a combined that contains everything you need to teach the novel and more! Included in the unit are pre-reading, active-reading and post-reading activities with grammar lessons, literary activities, a literary terms and elements matching quiz, a final essay test with grading rubric, and other activities just for fun! *This unit also includes a link to $70 worth of free instructional PowerPoint Presentations created by me to use along with the grammar activities in the unit! Middle School Novel and Grammar Units is committed to providing you with quality resources for your classroom, specializing in quality literature, grammar, spelling, and punctuation lessons for grades 4 to 8. Do not see the unit you need? Email me at perki_teacher4ever@msn.com . I am constantly looking for newideas for what to create next and would be pleased to hear from you. Great effort has been made to be sure that my units are free of error. However, if you do happen to find any inaccuracies, please email me so I can correct the error and give you an opportunity to redownload the product. CCSS.ELA-Literacy.RL.4.3 Describe in depth a character, setting, or event in a story or drama, drawing on specific details in the text (e.g., a character’s thoughts, words, or actions). CCSS.ELA-Literacy.L.4.4a Use context (e.g., definitions, examples, or restatements in text) as a clue to the meaning of a word or phrase. CCSS.ELA-Literacy.L.4.5 Demonstrate understanding of figurative language, word relationships, and nuances in word meanings. CCSS.ELA-Literacy.L.5.5 Demonstrate understanding of figurative language, word relationships, and nuances in word meanings. CCSS.ELA-Literacy.L.5.5b Recognize and explain the meaning of common idioms, adages, and proverbs. CCSS.ELA-Literacy.L.5.5c Use the relationship between particular words (e.g., synonyms, antonyms, homographs) to better understand each of the words. CCSS.ELA-Literacy.W.5.1b Provide logically ordered reasons that are supported by facts and details. CCSS.ELA-Literacy.RF.5.4a Read grade-level text with purpose and understanding. 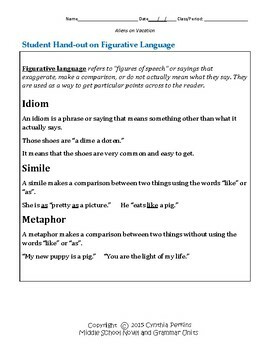 CCSS.ELA-Literacy.RL.5.4 Determine the meaning of words and phrases as they are used in a text, including figurative language such as metaphors and similes. CCSS.ELA-Literacy.L.6.5 Demonstrate understanding of figurative language, word relationships, and nuances in word meanings. 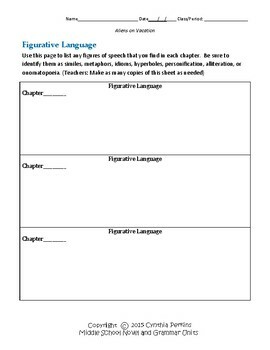 CCSS.ELA-Literacy.L.6.5a Interpret figures of speech (e.g., personification) in context. CCSS.ELA-Literacy.RL.7.2 Determine a theme or central idea of a text and analyze its development over the course of the text; provide an objective summary of the text. 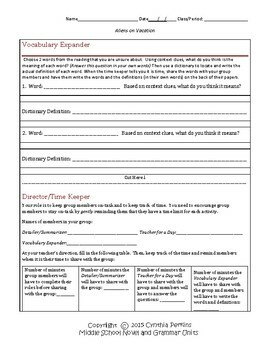 CCSS.ELA-Literacy.RL.7.4 Determine the meaning of words and phrases as they are used in a text, including figurative and connotative meanings; analyze the impact of rhymes and other repetitions of sounds (e.g., alliteration) on a specific verse or stanza of a poem or section of a story or drama. CCSS.ELA-Literacy.L.7.4a Use context (e.g., the overall meaning of a sentence or paragraph; a word’s position or function in a sentence) as a clue to the meaning of a word or phrase. CCSS.ELA-Literacy.L.7.5b Use the relationship between particular words (e.g., synonym/antonym, analogy) to better understand each of the words. CCSS.ELA-Literacy.L.8.4d Verify the preliminary determination of the meaning of a word or phrase (e.g., by checking the inferred meaning in context or in a dictionary). CCSS.ELA-Literacy.L.8.4c Consult general and specialized reference materials (e.g., dictionaries, glossaries, thesauruses), both print and digital, to find the pronunciation of a word or determine or clarify its precise meaning or its part of speech.